Traveling solo in Jeju Island is definitely not for the faint hearted, well unless you’re proficient in Korean. Even so, it may still be a challenge as the people of Jeju speak in native Korean, a dialect that is quite different from what you hear in Seoul. That said, nothing is really impossible; I can’t speak Korean for nuts, I travelled by myself in Jeju Island (including exploring Udo island and Seongsan Ilchulbong Peak) for 3 days, and I survived it! Domestic flights to Jeju Island can be pretty cheap – I bought my 2-way ticket for approximately $150 (via Asiana Airlines & Jeju Air). Most flights depart from Gimpo Airport, which is about 5 stops away from Incheon International Airport (via the Airport Railway a.k.a. AREX). There are 2 main cities in Jeju Island – Jeju City (Jeju-si) & Seogwiop City (Seogwipo-si). Jeju-si is the capital city of Jeju Island and you’ll probably end up there if you get in by plane. It is the bigger of the 2 cities and you’ll get plenty of choices in terms of accommodation and restaurants. I chose to stay in Seogwipo-si as it is nearer to the scenic attractions. The various cities are quite well connected by public buses; Seogwipo-si is about an hour’s bus ride from the airport, and about 1.5 hours from Jeju-si. 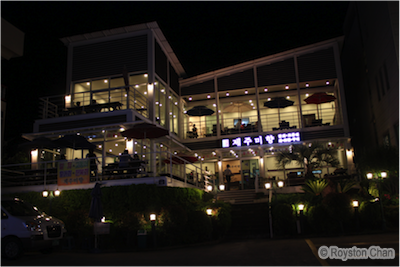 Another popular area is the Jeju Jungmun Resort. This area is about 30 – 45 minutes away from Seogwipo-si and houses many of the upscale hotels and resorts like The Shilla Jeju, Lotte Hotel Jeju or the more affordable Benikea Jungmun Hotel. The top hotels here have staff who can speak English and the area is near the scenic attractions. There is a beach nearby and it’s perfect for a seaside holiday. However, there’s a good price to pay if you’d like to spend your vacation in the Jungmun area; hotel rates are very much comparable to those in major cities like Seoul itself. Of course, you can also choose to stay in the remote areas of Jeju Island since there are many minbaks (Korean guesthouses) scattered around. However, transportation might become a problem, well that is unless you choose to drive. As you might have guessed, language is certainly a barrier in Korea, and this is even more pronounced in Jeju Island. Most people cannot speak or even understand English. On my first night there, I was at a restaurant supposedly famous for their seafood soup. However when I tried to ask about prices, the waiter could not even understand me. Most of these restaurants also do not have a menu with pictures; what they sell is usually listed on a board in Korean characters, and hence my helplessness at that point in time. By then, due to my feeble attempts trying to communicate with the waiter, I had everyone’s attention at the restaurant and could feel at least ten pair of eyes staring at me. Tried as I might, with gestures and even a Korean phrasebook, I could not get anyone to understand me. I had to walk out feeling utterly embarrassed and hungry. Getting around Jeju Island is best done if you rent a car. However bearing in mind that you don’t get much English road signs, and that you probably can’t get much help from the locals if you’re lost, it’s definitely a gamble but certainly the most convenient mode of transport. Alternatively, there are various buses that ply between the two cities (Jeju-si and Seogwipo-si) and also to the various tourist attractions on Jeju Island. Once again, language becomes a problem; I took quite a while locating the Seogwipo Intercity Bus Terminal. Fortunately by means of hand gestures and the use of a map, a kind ajumma (Korean middle aged woman) pointed me to the right direction. I didn’t even know when the bus was arriving or how to identify the bus. Thankfully the kind old man gestured to me when the bus was there. 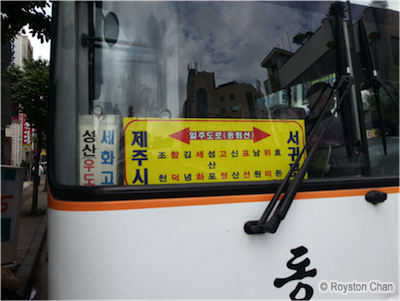 It’s a good thing that these buses now come with pre-recorded announcements of the various bus stops, in Korean, English, Mandarin and Japanese. If not I wouldn’t have known when to alight! Although public buses are pretty frequent (perhaps an interval of every 20 minutes or so), attractions in Jeju Island are too far apart and it’s easily a bus ride that takes an hour or two. Further, bus stops not located within the cities only have bus schedules in Korean, which makes travelling around the island even more difficult. Driving is definitely the better option. Jeju Island is famed for its fresh local seafood and I couldn’t leave without trying it. By then, I had learnt to choose appropriate restaurants to have my meals so as not to repeat my ordeal on the first night. 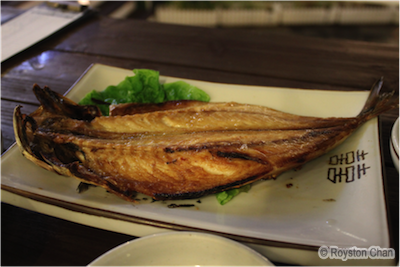 Hence on my last night there, I went to a local restaurant for grilled mackerel. As with any typical Korean restaurants, the meal came with an array of delicious side dishes, but I must say the grilled mackerel is to-die-for! The fish is marinated with salt, grilled to perfection, and served warm. It was so good and just the perfect ending to my 3 days stay in Jeju Island! Having said all that, I must have succeeded in scaring away many potential travelers to Jeju Island! However, you’ll then be missing out on all the good scenery and interesting sights there. To be honest, I think Jeju would have been much more enjoyable if you travel there in a group. Your group could then rent a car and it’s much more convenient to drive to the attractions. Even if you do get lost, you’ll have more resources navigating your way back. It’s not easy but it ain’t that difficult too! Plus it’s also less scary when you’re with friends! The attractions are so far apart so it’ll be good to have some company to make merry along the way. 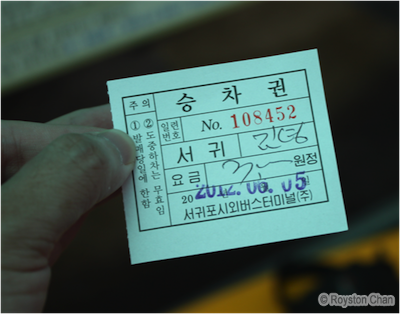 Of course, you could also splurge on a good hotel stay at the Jungmun area. 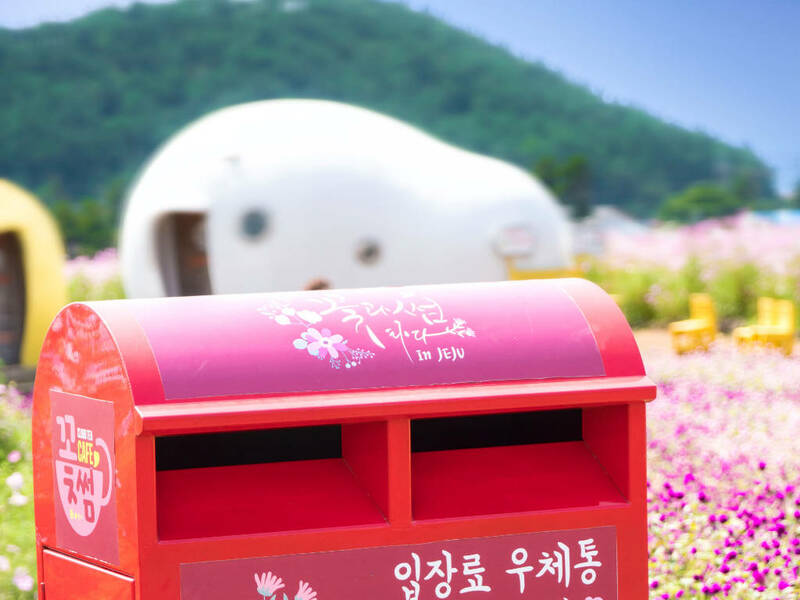 Jeju Island is a popular spot for honeymooners and it’s certainly a very laid back and relaxing place to spend some quality time with your loved ones.